I haven't done any mustang paintings in awhile, so recently I visited the online adoption gallery of available horses on the Bureau of Land Management's website. I go through a lot of photos to find the few that 'speak' to me. I look for lighting, for emotion, movement, color, something that will work well in the formats I like to paint in. I went through all the horses, saving a few aside, and then.....there were burros! Lots and lots of burros. Unfortunately most had their photos taken in flat light (either a cloudy day or after the sun went down, so no shadows, nothing to suggest form). 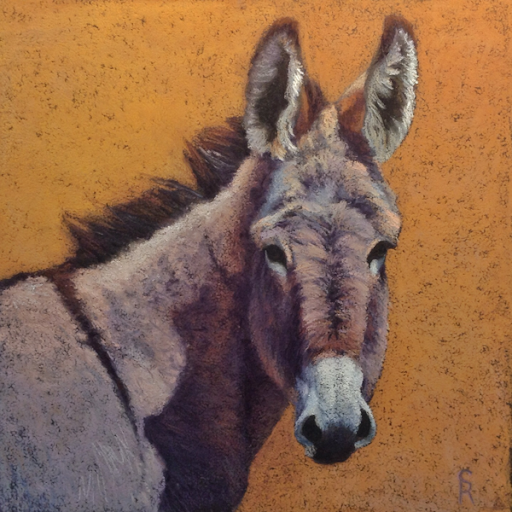 That is fine for potential burro adopters, but not so great for me, the painter. I did find a few, though. 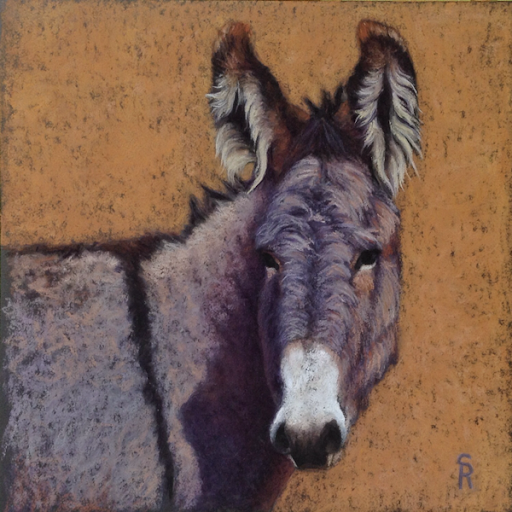 Their cute furry burro faces lend themselves well to paintings, don't you agree? The first, a jenny. Photo reference for this and the next one are courtesy of the Bureau of Land Management. Their description of her is "#4558 - 6 yr old gray jenny, captured 10/2011, from outside an HMA, California". Outside of an HMA-Herd Management Area means technically she is not protected by the Wild Horse and Burro Act, but she has found her way to a facility anyway. I am not sure exactly how that works, though. Both of these paintings are 8X8 in soft pastel and are not currently for sale, I am building up inventory for a show at the end of July. After the show any that are not sold will be made available here and elsewhere.